Just remember, the dough has to be moist and pliably kneaded to avoid tearing. Look at my recipe, you will be amazed by how easy you could make it to impress your guests during your party or as a treat to yourselves. And, what else? Take this opportunity to create bonding with your kids. This easy kueh making session also creates fun and joy for the young ones. 1) Bring a pot of water to a boil on medium heat. Boil sweet potato till soft. Drain and place in a large mixing bowl. Finely mashed. 2) Add glutinous rice flour, rice flour, salt and oil into mashed sweet potato. Add in water in batches. Get your child to help adding it a little at a time with a tablespoon while you knead till a soft and non-sticking dough is formed. 3) If you choose to make this ondeh-ondeh in green, add the green essence or colouring and continue kneading till well combined with the entire dough. 4) Place a 50-cent big of dough in your palm and roll into a ball. Then flatten the ball and make a well in the centre with your finger tips. 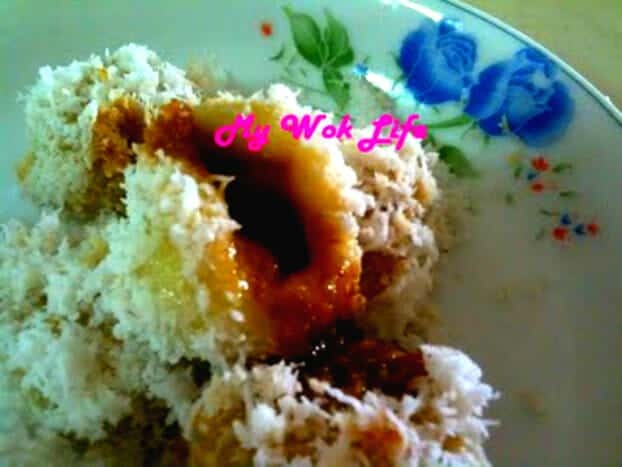 Fill a dice of gula Melaka in the well, pinch the opening together to seal it, and then, roll into a ball again. Enjoy the bonding moment with your child(ren) and repeat step with the rest of the dough. 5) Bring a large pot of water to a boil on high heat. Place ondeh-ondeh balls into the boiling water, one by one. Reduce heat to medium-low fire, simmer the balls till float up once they are cooked. Stir the balls occasionally to avoid sticking. 6) Remove and drain ondeh-ondeh balls from water. You may want to rinse the hot cooked balls with cold water once, to enhance its chewiness. 7) Heat a dry wok over low fire, place Pandan leaves and let it sauté a little while before adding desiccated coconut. Let both the Pandan leaves and coconut sauté on the heated wok for 2-3 minutes. Stir fry occasionally. Sprinkle salt and continue to sauté till aromas of the coconut releases. Heat off and cover wok with lid to let it stand for a while. Transfer coconut into a large bowl. 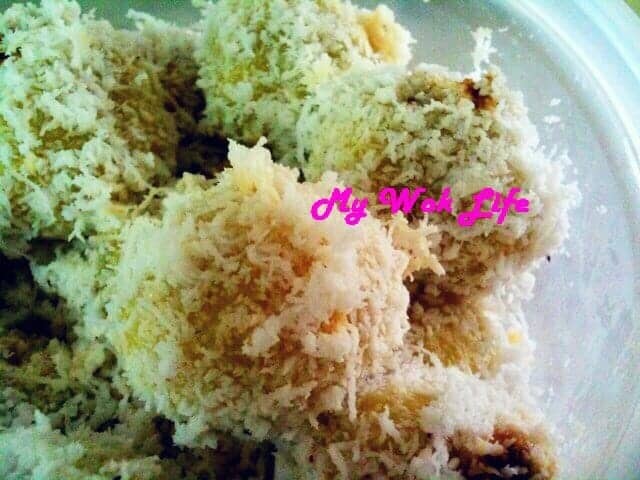 8) Place slightly cooled Ondeh-Ondeh balls into a bowl of desiccated coconut and gently coat the entire balls. 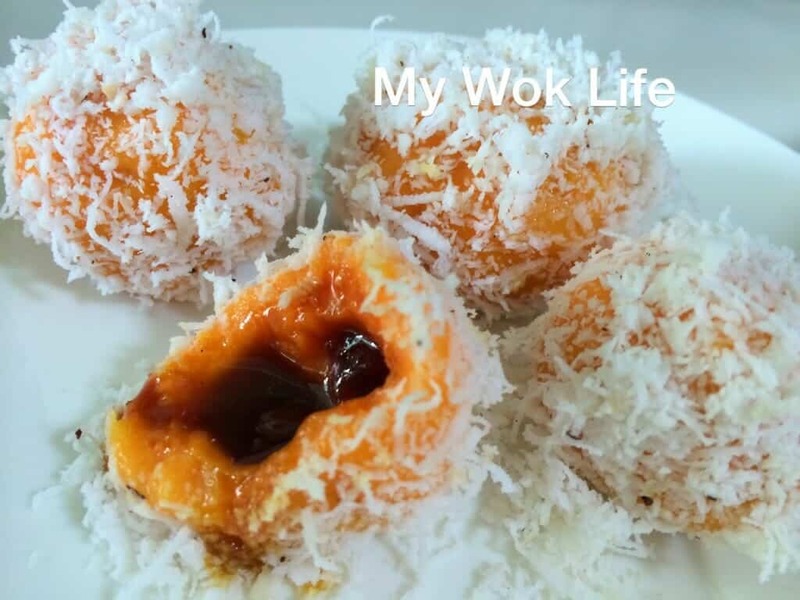 Best served warm and enjoy the oozing sweet sensation of gula Melaka filling in your bites! This Ondeh-ondeh is a vegetarian food. 1 bite-sized ondeh-ondeh kueh counts about 20kcal. Tips: To yield bouncy and moist dough, adding of sufficient amount of water during the kneading is important. Use warm water, if possible. * Green food coloring or pandan essence can be replaced with natural pandan leaves juice. Blend leaves to extract 2 tablespoons of its juice for use. * Gula Melaka (Palm sugar blocks) is available in major Asian supermarkets and neighborhood provision shops. * Add more diced Gula Melaka, if more filling preferred. ** The Ondeh-ondehs in my photo were not added with green coloring. Its appearance was simply the natural colour of the sweet potatoes. I used orange fleshed sweet potatoes, or Japanese sweet potatoes, as below picture. I wud like to try the onde onde featured in ur recipe. R u able to advise me whether adding of tapioca flour is better vs. rice flour? Which will give a chewy texture? 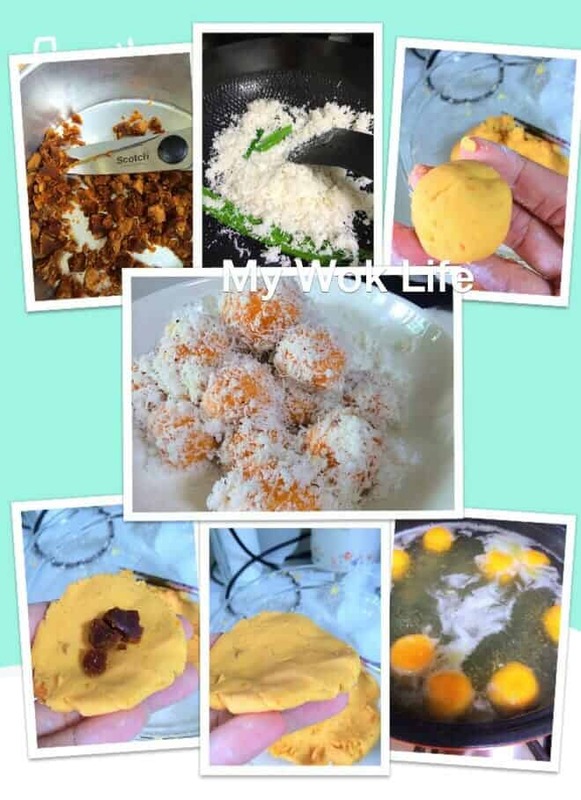 I wud like to try out the onde onde recipe featured in ur blog. Pls advise me aside from the glutinous rice flour, wud it be alright if I can the 30 gm rice flour to that of tapioca flour. Which flour – rice or tapioca flour will give me a more chewy texture? 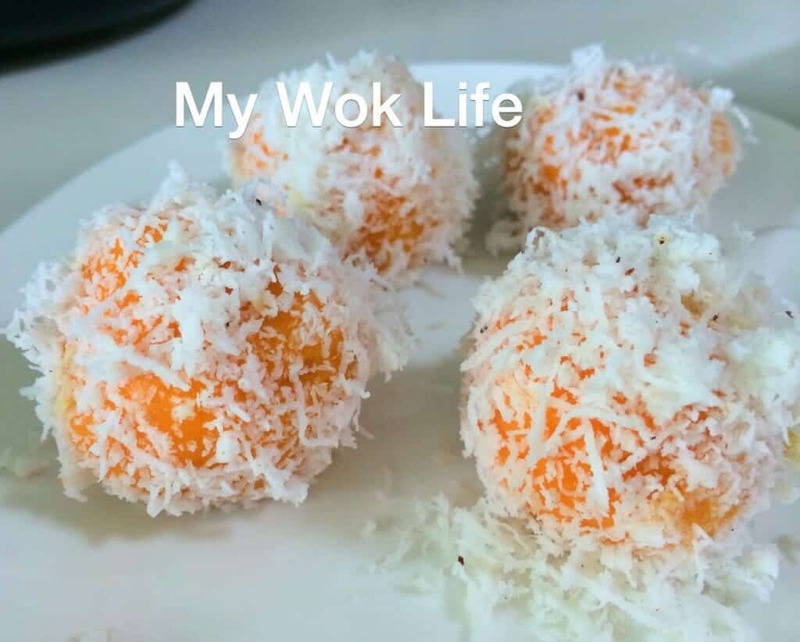 Hi, I would love to make this dish, but where can I buy the desiccated coconut? My hse nearby provision shop didnt sell. Hi Lyn, it’s quite hard to find freshly grated coconut nowadays. I got mine from Bishan St 22 wet market. Otherwise, do consider pre-packed store-bought one from supermarkets. I know NTUC Xtra sells. Look out at the baking supplies section. I had try it out. And the dough turned out ok:) but when the fill Gula Melaka wasn’t fully melted ! I boiled for 15 min. And i storage in fridge overnight. next day the onde onde become hard. The dough i used one cup glutinous flour, half cup topioca flour. Pls advice where the problem. Hi, you may try to crush the gula Melaka into more finely form. It shouldn’t have problem melting then. As for storage, In fact, it’s quite hard to keep refrigerated without the artificial softener being added to our homemade ondeh, but don’t give up, the cooked ones must be stored in air tight container. You may also try to add a layer of cling wrap on top before covering with the lid. It should be able to last 1-2 before turning hard, mine was fine. I was facing the same problem, stored it in airtight container and kept in the fridge. Next day the ondeh ondeh dough still became hard too. May I know your above replied, meant 1-2 hours or 1-2 days? If harden, just steam to soften before eating.